Airswift Couriers Ltd provides a parcel delivery service. It is exclusively dedicated to acting as the Authorised Service Contractor for UPS in Malta. In sixteen years it has developed into one of the major Express players on the Island. For customer service EU packages kindly call on 99271121 while for non-EU packages kindly call on 99271126. For further information or to track your parcels please log onto our main website www.ups.com. SkyNet Worldwide Express is an international distribution and logistics company with presence in more than 209 countries around the world and with extensive experience in the courier and expedited cargo industry. Independently owned and locally operated, the SkyNet Worldwide Express Network is a unique international courier cooperative. It is composed of locally owned courier companies operating as SkyNet licensees. Together they comprise the largest independently owned and operated courier network in the world, providing reliable desk-to-desk service to over 209 countries. SkyNet Worldwide Express is represented in Malta by Xpress Logistics Limited, which is a member of the Gollcher Group of Companies. TNT Express offers an economical solution for less urgent parcels and freight around the globe using the Economy Express service. • Door-to-door import and export worldwide • Excellent transit times • Customs clearance excluding duty and VAT • Export consignments start at over 20kg and up to 7000kg Individual pieces can weigh up to 900kg if palletised measuring 2.0m x 1.2m x 1.8m. • Import consignments start at over 5kg • Competitive rates. The Economy Express service is part of TNT’s industry leading Express Road Network, which reaches over 40 countries in Europe and Northern Africa, connecting them to the rest of the World through TNT’s global air network. 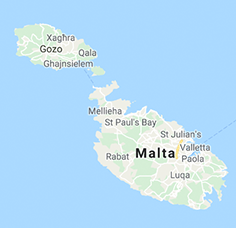 Air Cargo Logistics Limited is now offering a London to Malta courier service for your Commercial and shop on line. Special rates are available for more than one parcel. For parcels that reach our UK office by Tuesday noon your parcel will reach Malta by following Monday. Terms and conditions apply. Items classed as hazardous/dangerous for carriage by airfreight are not accepted. Please call for further details. Subject to change without notice. For further information please call us or e-mail us on aircargoacl@aircargoacl.com and we will pass to you full information or you can also visit our other website . S. Curmi & Sons is a company that has developed a strong character, focusing individual needs of our customer. Keeping in mind the constant changing needs of our clients and increasing competition has resulted in very competitive tariffs. We handle all our cargo with own handling equipment and transportation affected with our own transport means. Being a Licensed Customs Broker and Hauler since 1975 we grew to believe that fast and professional service is the most important ingredient in our business. We always train our staff to offer a caring attitude towards our customers letting them keep their mind at rest that their product is being handled in the most secure and professional manner.